05 Jan 2014 / 16:29 H.
KUALA LUMPUR (Jan 5, 2014): The first Sunday of the month will be 'Cycling Day' in the city of Kuala Lumpur. 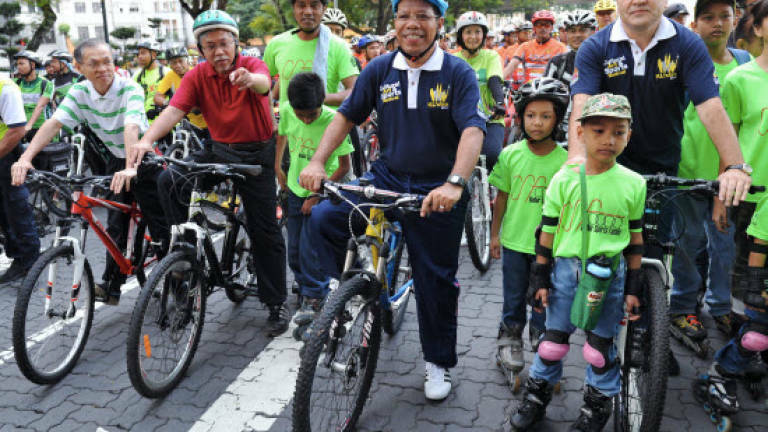 Mayor Datuk Seri Ahmad Phesal Talib said today several roads would be closed for two hours from 7.30am to make way for the pedal power in keeping with the city's desire to promote a smoke-free environment. Fifteen roads would be closed during the two-hour period, namely Jalan Sultan Ismail, Jalan Tuanku Abdul Rahman, Jalan Raja Laut, Jalan Senggarang, Jalan Ampang, Jalan P. Ramlee, Jalan Pinang, Jalan Kia Peng, Jalan Stonor, Jalan Conlay, Jalan Raja Chulan, Jalan Semarang and Jalan Tun Perak, he said. Ahmad Phesal said City Hall would draw people from all walks of life to make use of the opportunity to cycle as a healthy activity and to use the bicycle as a means of transportation in the city. He spoke to reporters after participating in a cycling programme, intended to be the first of the monthly cycling day activity, in conjunction with the "Green Car-Free Morning" event during which he launched the Sunday cycling activity. Ahmad Phesal joined almost 2,000 people in cycling for about six kilometres in the city from 7.30am. He also said that under the 'River of Life' project, City Hall was considering providing special lanes to encourage city folk to use the bicycle as a means of transportation in the city. The 'River of Life' is an Entry Point Project (EPP) in the Greater Kuala Lumpur/ Klang Valley National Key Economic Area (NKEA) under the Economic Transformation Programme (ETP) aimed at transforming the Klang River into a vibrant and liveable waterfront with high economic value. "We have started identifying bicycle lanes to connect one sector to another in the city. This will be realised soon," he said. Ahmad Phesal said the monthly cycling programme in the city was in line with the desire of Prime Minister Datuk Seri Najib Tun Razak to turn Kuala Lumpur into a green city. Civil servant Mohd Saleh Kos, 49, said he felt that the monthly cycling programme in the city would augment the beneficial and healthy activities for city folk. "The cycling activity can also help bonding between children and their parents who were preoccupied with work the rest of the week," he said.